Cameos are the jewelry I'd like to share. Even though my father was a jeweler, we females of the family didn't own or wear much jewelry. My mom and I both had lockets. I suppose my sister did, too, but I don't remember. My mother had several rings, including her engagement and wedding rings, a single strand of pearls, some earrings that she wore frequently, and these cameos. She had other jewelry but none that is memorable. 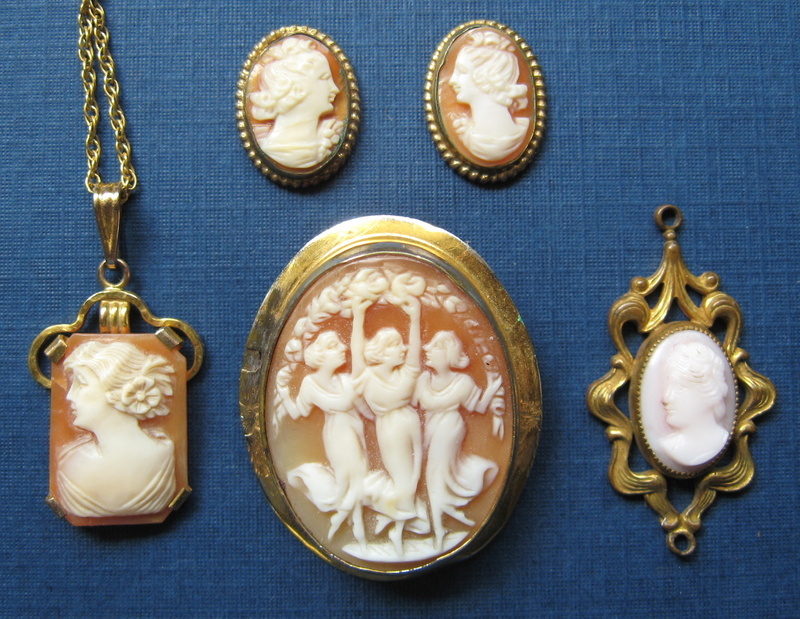 When I was little I loved the larger cameo brooch with the dancing ladies. Who knows why something catches a child's fancy? Perhaps the dancers looked happy, even flamboyant to my young eyes? When Mom wore the brooch she also wore the earrings, above it. They are not exactly matching but since they're separated by a face, I doubt anyone compared them. I don't remember my mother wearing either pendant. The one on the left is my favorite these days. I love the details of it. The one on the right is so pale that it didn't photograph well. It must have been a part of a larger piece of jewelry -- at least that's what I guess because of the rings both top and bottom. As I was researching cameos today I learned that I have not been as kind as I could have been to these. They have been together in a fabric holder but because they are susceptible to scratches and breakage they should be carefully stored either laying in their own places without touching other pieces or gently wrapped in fabric. I also learned that they can be cleaned with white toothpaste and a soft toothbrush. Because the shells dry out, they also need to be conditioned a few times a year with baby or mineral oil left on overnight and removed with a soft cloth. I love these cameos but they've been hiding away and I rarely look at them. Maybe I should find a small shadow box so I could display and enjoy them. This post is a contribution to Alona Tester's Family History Through the Alphabet challenge. You can read more about the challenge and find links to others' posts at her blog, Genealogy and History News. Thanks, Alona. Nice Nancy. I gather you don't know where they came from or how old they are. You definitely displayed them nicely. Thanks. 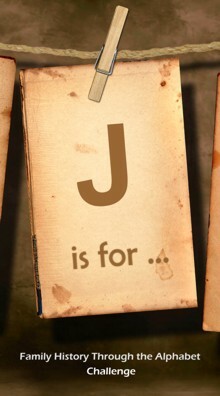 This is a great word for J. I'm doing the A-Z challenge and I think I may borrow this idea for day after tomorrow. whew! Enjoyable post. I had no idea that cameos needed to be stored so carefully, not that I have any.